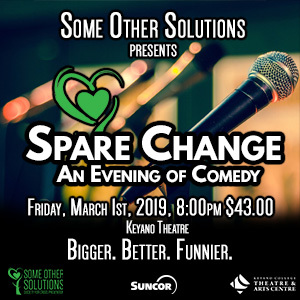 Some Other Solutions is proud to present: Spare Change - An Evening of Comedy. This unforgettable evening of entertainment not only features local artists, but 100% of the proceeds go towards Some Other Solutions Society for Crisis Prevention. Some Other Solutions has been an established non-profit organization in Wood Buffalo for over 30 years, and has provided countless community members support through either the 24 Hour Crisis Line, in-school mentorship for students, or through offering emotional support services (meetings or presentations) for citizens in need. To continue their valued service to the community, Some Other Solutions is looking to build their capacity through a fundraiser to allow the Wood Buffalo community the opportunity to give back and support the organization, while offering a night of entertainment. This event is presented in partnership with Keyano Theatre, and made possible with the generous support of Suncor Energy. Spare Change: An Evening of Comedy features local Wood Buffalo comics Erica Moeskau, Renee Manners, Cindy Rivers Haan, Brad Karp, and is hosted by Justin Shaw.